Yes, please share this Bill with everyone you can. This bill can BE USED TO FURTHER OUR CAUSE IF USED OFFENSIVELY. IT REALLY IS THE FEDERAL GOVERNMENT FAILING TO STAND BY ALL ADOPTEES AND LETTING THE STATES PICK AND CHOSE HOW THEY ARE GOING TO TREAT US. I say this over and over… But there is NO “except for adopted persons” clause in the US Constitution. This could be an issue that would go all the way to the Supreme Court if argued properly. It has been announced that AB 1325 (Beal & Cook) will go into effect in July, 2010. This bill will allow adoptions to occur without the termination of parental rights for Native children. Why is it that Native American children relinquished for adoption are treated BETTER than non-Native American children relinquished for adoption in this State? Why is it that ICWA protects their rights to their identities via their original birth certificate and their rights to Tribal membership? Why do they get to know who their biological parents are when they turn 18? 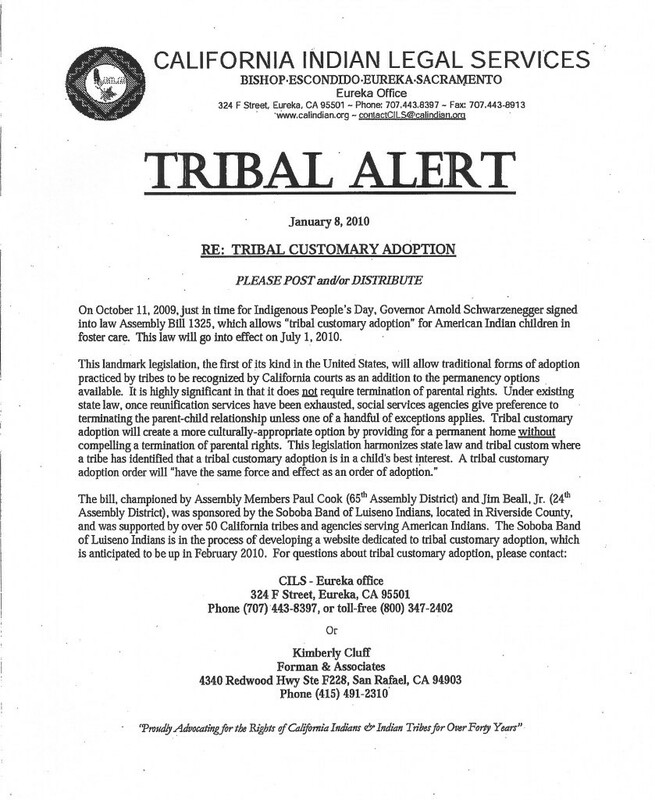 Now, AB 1325 takes this preferential treatment for Native American children relinquished for adoption one step further. Why is it that MY representatives in the Assembly refuse to release MY ORIGINAL BIRTH CERTIFICATE TO ME? I am 40 years old. Please explain to me how my civil rights are less important than the civil rights of Native Americans. I look forward to a response from at least my representatives in the 1st District. For those on this site who are angry at Native Americans for being allowed to incorporate a cultural tradition into law and asking why – here goes: Native children have literally been stolen from Native homes, abused in boarding schools, been victims of genocide in the not so recent past, etc. etc. As a result, Tribal numbers were hugely diminished and the culture almost was completely eradicated. We can’t say that about white culture in America – can we? Fee free to look up the Indian Child Welfare Act if you want the official info on why Native American Tribes need rights specific to their culture. Further, if you are for obtaining more rights for non Native children – why not go to your representatives and ask for them or organize – rather than spending your time being pissed at Tribes being able to reclaim their children? Work on your own causes and stop trying to rain on everyone elses parade. You are so right! We at this site are with you 100%! This is an adoption-rights website and we DO understand what happened to native children and native culture! We are not being pissed at native tribes for being able to reclaim their children. We are, however, trying to incorporate the law that allows native tribes to do so into the general adoption policies of America so that ALL adoptees (both native and non-native) can enjoy their own cultural and birth heritage! Please ridiculers accept the point of view of those yiou calim to love. respect us, because without respect you might as well get a pet to love such is thelow level of real concern for the real human condition monitored here. Thank you, Angela, for your excellant points. respect is key — adoptess and our natural parents do not get respect. That is the point that makes blogs such as this one, and about-orphans.blogspot.com, neccessary. Adoptees and ivf-sufferers (people created by sperm donation and egg donation) need respect so that our rights will be recognized. The only ones who will challenge you are the ones who are afraid of the truth. PS why do I get the hunch that I will be chalenged? Why should I be challenged at all? There is something very concerning; how do adoptees establish accurate medical records? I suspect that people see this possible problem, which can develop into a large one, as something avoided thru luck, but for every child who doesn’t have this problem then that makes for greater bad odds for the next one. I can almost hear a telling off from an adoptive parent somewhere or even an adoption agency boss (or both, separate or in combination:) but it matters to life insurance companies and the victims of current adoption practises themselves. On this wesite (and others) I am amazed at how shoe-horned adoptees can be with attempts too silence them by people who are not in thier shoes but who can’t acknowledge thier pain. I think as a metaphor for parenting, this shoe-horning is scary. Maybe I should put it like this – adoptees are adults whose firm campaign efforts and the statements arising from the campaigning must be accepted once and for all. Some adoptee campaigners are not teenagers but fully grown adults who have been chipping at the rock face for all of thier adult lives. So adult to adult (I’m quite old at 57) please – one rule for all – most everybody has their accurate paper, a birth certificate, it’s just a peice of paper, doesn’t cost anything, but means the workd to us. I think thst dissenters take alot for granted; you’ve got accurate medical records, lucky people you are because of it. Yes, I highly recommend Nancy Verrier’s books. The link you provide to a website that reveals how adoptees feel is very important. If adoptive parents really understood what they are doing, the damage they are causing, (more importantly — those who are in control of Adoption’s Big Business), there would not be adoption as we know it. Adoption is child abuse. However, when a child truly needs a home, Guardianship is a safe alternative to closed and sealed adoption. Instead of giving attention to stupid stuff in Talking Heads Cable News and rambling politics, THIS is the more important News that goes unreported. How many mixed race kids will be subjected to forced closed and sealed adoptions with falsified birth certificates and terminated parental rights just because the percentage of Native Blood could be lower than 1/4? The writter and sender of this letter is right: why are Non-Native American adoptees descriminated against by adoption laws?